Hands and Heart is a collection of sometimes extraordinary, often heartwarming stories of dedication, heroism, stress, exhaustion, joy, and occasional defeat. The book takes you along on a journey of everyday life as viewed through the eyes of a general surgeon. Michael DeHaan has been practicing general surgery for 22 years in the western suburbs of Chicago, Illinois. 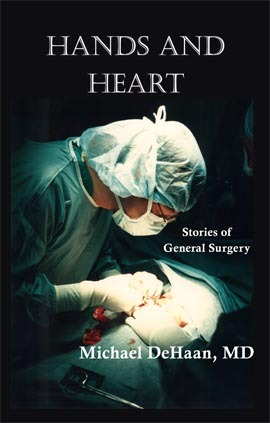 Hands and Heart is his first published collection of stories of the sometimes stressful, but always miraculous, world of general surgery. As I entered, I could hear the faintest breathing from the patient. As the anesthesiologist quietly confirmed my suspicion that he could not get the breathing tube in, the patient took his last breath and passed out. The clock was now running. I sprayed the antiseptic on the neck, took the scalpel, and opened the recent incision. A whole lot of blood came out. The windpipe was now lying almost completely free in the middle of the incision. With the clock still running, I made an incision in the airway and slipped the breathing tube in. We immediately started getting oxygen by “bagging” the patient. The oxygen level we were monitoring in his blood came back and he woke up…. “Nice work, wooden shoe!” proclaimed the assisting nurse.